As many of you know by now, I'm LDS (aka Mormon). For those of you that didn't know... SURPRISE, I'M MORMON!!! 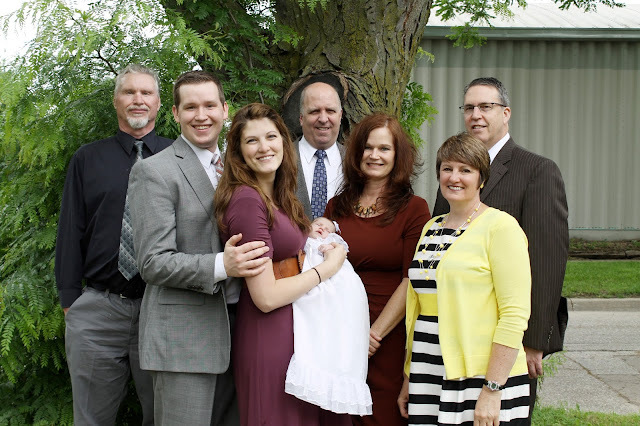 Now that we're all clear on that, I wanted to share some pictures from Elsie's blessing day (Sunday, June 9, 2013). Before I share the pictures, I guess I could give a quick summary on what, exactly, a baby blessing is. In the LDS church, we do not baptize infants (the age of baptism in our church is 8 years and older. I'd tell you more about that, but that's a whole long post of its own), but we do bless them. Basically, this is a blessing where the child is given a name (officially) and a blessing for their life. It can be done at home or at church, but either way, it's a very special and sacred occasion, and family usually gathers for the event. Elsie wore the same dress that I was blessed in - it was a little big on her, but I thought she was just perfect. 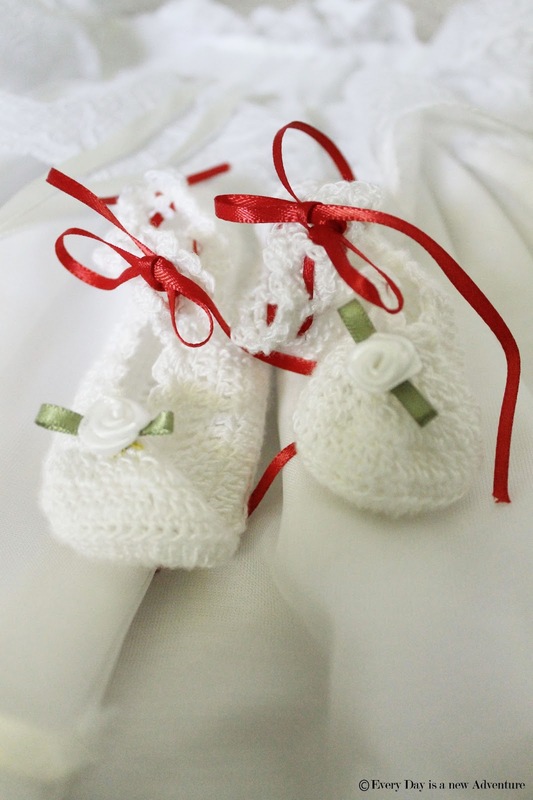 The booties are hand-made - my mom is amazing at crocheting, and she crocheted these little booties for Elsie the day before the blessing! I hope that these become a family heirloom, because they are absolutely beautiful. We didn't really go crazy on Elsie's blessing day with a brunch or anything like that - we just kept it simple and hung out with our families. Those booties are so adorable! I love them! The gown is beautiful!!!! My little one went vintage on her baptism day and wore my baptismal gown from the 80s. Thanks for sharing this - interesting to learn about how other churches do things! Oh my gosh those booties and that gown! DARLING. 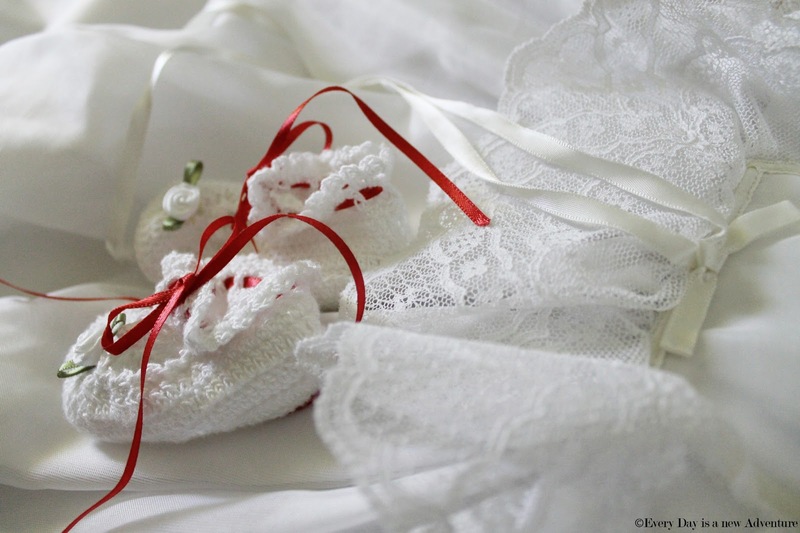 Wow, how special your mom made those booties and what a great occasion to get together! bahahahahahaha loved your "Surprise, I'm Mormon" comment. 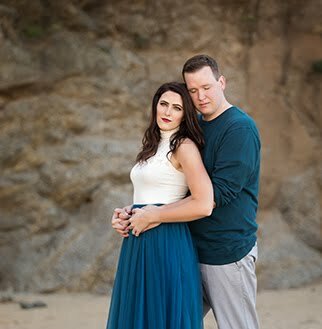 Do you have a close up picture of her in the blessing dress? I'd love to see it! I think it's so neat that she was able to wear the same dress that you did! Also, I would LOVE for you to post more about the LDS beliefs and traditions because I know nothing about it! She looks so tiny in her dress! :o) Those booties are precious. I'm sure Elsie's children will wear them some day. So what kind of blessing do you give them? Is it different for every child? The booties are amazing - so beautiful. Also, knowing that you're 6'1 - I just can't believe how tall everyone in your family is. You have such a beautiful family. And those booties really make me want two tiny feet to put inside something so precious. Is that too creepy? Oh well, I only had 4 hours of sleep, let's roll with it. Aww, what a super sweet family photo. And PS - your family is TALL! Aw congrats! And how fun to have her wear your blessing gown! The booties are adorable too!!! Those are just about the sweetest little booties ever! That made me laugh. :) Those booties are adorable.